Full moon on the Greek islands is certainly an unforgettable experience. 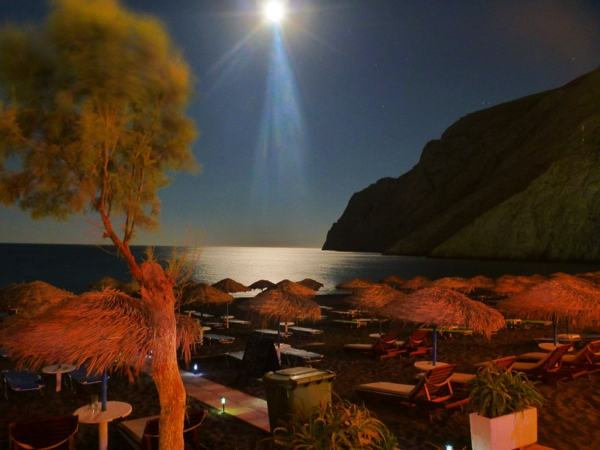 If you are on the eastern beaches, such as Kamari, Perivolos and Perissa or if you are somewhere high, like Pyrgos, Imerovigli, Oia, Firostefani, Fira, and the other beautiful villages of the island, you will see an amazing Santorinian full moon rising from the sea. Although August full moon has always been considered the largest, brightest and most charming of the year, the autumn moon quite often proves it wrong! So, enjoy this small miracle of nature together with your beloved and let your five senses open up!